April 2018 saw the most gun-related checks run through the Federal Bureau of Investigation's background check system. The National Instant Criminal Background Check System (NICS) ran 2,233,213 checks in April, according to an FBI document. That's nearly 90,000 more checks than the previous April record set in 2016. It also represents the second month in a row to set a record with March seeing 2,767,699 checks. The drop off in background checks between March and April matches the industry's typical sales cycle where more guns are sold in winter months than in summer months. December tends to be the best month for gun sales in any given year. December 2015 holds the record for most checks in a month with 3,314,594. 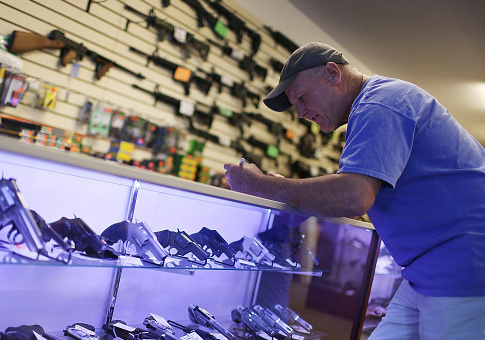 NICS checks are one of the strongest indicators of gun sales in the United States. While there is no federal registry of firearms, NICS checks are required on nearly all sales conducted by licensed gun dealers. The number of checks does not perfectly correlate with the number of gun sales, though. Most states do not require NICS checks for sales of used firearms between nonlicensed individuals, many states use the checks during the gun-carry permit application process, some states don't require a NICS check during sales to those with gun-carry permits, and multiple guns can be sold during a single NICS check. "These statistics represent the number of firearm background checks initiated through the NICS," the FBI wrote in its report. "They do not represent the number of firearms sold. Based on varying state laws and purchase scenarios, a one-to-one correlation cannot be made between a firearm background check and a firearm sale." The National Shooting Sports Foundation, the gun industry's trade group, said its analysis of the numbers found that checks related to gun-carry permits may have driven the record NICS numbers more than gun-sales checks. The record number of NICS checks came as the push for new gun control remained in the public eye, and some states enacted new laws. Vermont's Republican governor Phil Scott flip flopped and signed a new gun-control package that outlawed magazines of varying sizes and gun ownership for any adult under 21-years-old in April. The town of Deerfield, Ill., also announced its own ban on certain rifles in April. Both measures are now being challenged in court. This entry was posted in Issues and tagged Guns. Bookmark the permalink.